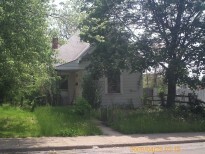 View - 2409 E Brookside Ave.
Price included vacant lot located at 2405 E Brookside Parcel # 1018558. Home is located close to Brookside Park. Home needs work, but could make great investment for portfolio.